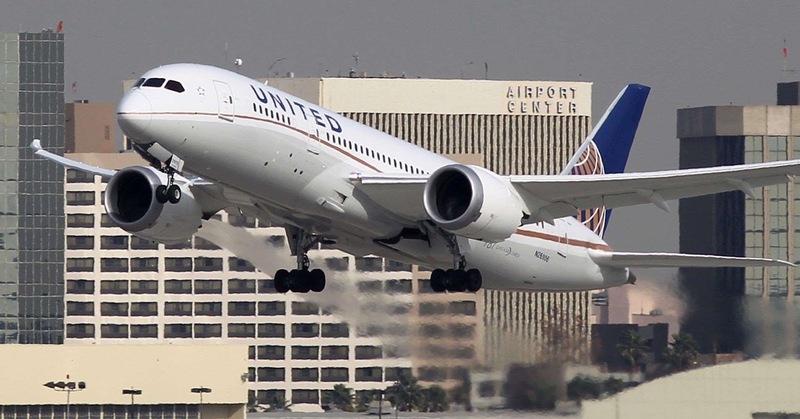 A Boeing 787 Dreamliner operated by United Airlines takes off from Los Angeles International Airport. United is deploying its brand-new Boeing 787-10 jet on service between Newark and Los Angeles. The flights offer United's first premium economy transcontinental service. LAX is one of the most competitive airports in the country. The Boeing 787-10 can fly for more than 6,400 miles without needing to refuel. United Airlines is deploying it for a route that's less than half as long. United this week debuted its brand-new Boeing 787-10, the largest of the Dreamliner jets, on one of its flights between Newark and Los Angeles. It hopes that serving the route with the 787, which airlines more commonly use on long international flights, will give it a leg up in the battle for lucrative cross-country travelers. In February, it will start offering a flight between Newark and San Francisco using another 787-10. The airline ordered 14 of the planes. Others will be used on routes to Europe. In United's favor, the new plane is more fuel efficient and holds more passengers than most other planes it flies cross-country. Airlines have been racing to improve cross-country service, going after high-paying business travelers in big cities like Boston, Seattle, San Francisco, Los Angeles and New York. Delta Air Lines, for example, started offering its Delta One cabins on domestic routes last April, including from Boston to Los Angeles, and New York to Los Angeles, San Diego and Seattle. The cabins feature lie-flat beds and Tumi amenities kits. Travelers also can book meals ahead of time. JetBlue Airways has expanded its Mint business-class service to four West Coast cities from Boston and New York's John F. Kennedy International Airport. American Airlines operates a three-class cabin — first, business and coach — on its transcontinental service between New York and San Francisco and New York to Los Angeles. It's adding more flights with that configuration from Boston to Los Angeles this spring. So why is United starting with Los Angeles? Los Angeles International Airport is the most competitive of all large U.S. airports — no single carrier has more than 18 percent of the seats flown, according to consulting firm ICF. By comparison, American Airlines has 90 percent of the capacity in Charlotte, North Carolina. "It's a very valuable route, one of the only routes in the country where there is meaningful paid first-class demand," said Samuel Engel, head of the aviation practice at consulting firm ICF. He estimates that revenue per passenger on flights from New York to Los Angeles and San Francisco and similar routes from Boston are 5 to 10 percent higher than others of a similar distance. In mid-April, United had 11 nonstop departures from Newark to Los Angeles and the remaining 10 are slated to be operated by a Boeing 757, a smaller jet. United is also using a Boeing 777, it's largest Boeing jet, to fly from Newark to Los Angeles. The 787-10s will be outfitted with 318 seats, including 44 Polaris seats — their highest class of services — and 21 in the premium economy section. It's United's first scheduled service with premium economy tickets, but perks like the amenities kits and special dining service won't start until March, a spokesman said. American and United each have used 787s on other routes around the country, but the service will be the first scheduled nonstop transcontinental service using the planes. Travelers can search for the type of plane on the route when they book, but aircraft can always change due to mechanical or other issues.